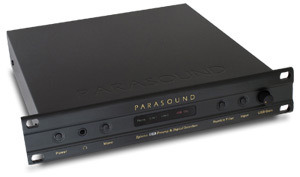 Ron said: With the Zphono.USB Parasound has created a niche product that, for audiophiles and music collectors of a certain age -- or any age, for that matter -- may prove supremely useful. As a phono stage it hits way above average, and if offered alone would be exceptional value for the price. Actually, it is offered alone, in the form of the original Zphono (still available for $200). Consider the inclusion of the flexible, high-quality A/D converter as almost a gift. This is a smart, sensible, well-made product that makes it fun to be in this hobby. The gist: Analog to digital done right and cheap.